Barcelona's Lionel Messi and Neymar have been left out of Uefa's Champions League group stage XI, despite the pair contending for the Ballon d'Or award. Luis Suarez, Barca's top scorer with five goals in Group E, also missed out. 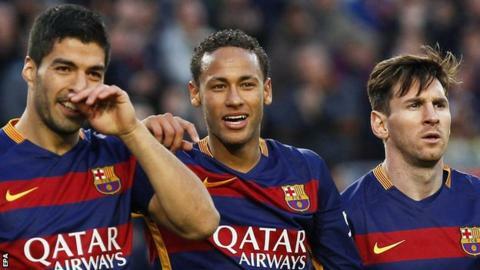 The forward trio scored 10 goals between them as Barcelona became the first to qualify with 14 points. Real Madrid's Cristiano Ronaldo, Zenit St Petersburg's Hulk and Bayern Munich's Thomas Muller make up Uefa's attacking unit in the 4-3-3 formation. Ronaldo, last year's Ballon d'Or winner, scored 11 goals during Madrid's group campaign. Messi only played three matches in the opening stage, scoring three goals, after missing seven weeks of the season with a knee injury. There is Premier League representation in the XI, with Chelsea's Willian and Manchester City's Raheem Sterling in midfield. Brazilian Willian scored five goals, while England international Sterling grabbed three, with two coming in the final group game against Borussia Monchengladbach.